Dwindling membership has the Village Quilters hanging by a thread, and group leader Meadow Downey is desperate to recruit some new folks. With Beatrice’s blessing, she attempts to weave frequent quilt show judge Jo Paxton into their fold. As the town’s irascible mail carrier, Jo delivers trouble wherever she goes. And with all that mail at her fingertips, she knows everyone’s business. Soon Beatrice wonders if they’ve made the right choice. 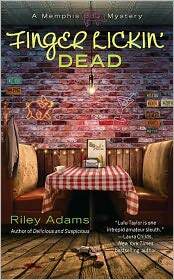 The Memphis Barbeque Series, by Riley Adams (pen name for Elizabeth Spann Craig). Barbeque restaurant owner Lulu Taylor dishes out justice, ribs, and humor from Beale Street. Publishers Weekly: "A sassy first in a new series from Adams." Book one of the Memphis Barbeque Series. When a food scout from a cable cooking channel is murdered, it's only natural for restaurant owner Lulu Taylor to take it personally. After all, her barbeque restaurant served the scout's last meal. But danger lurks as Lulu investigates the crime. Will she clear the restaurant's name, or is she next to be skewered? 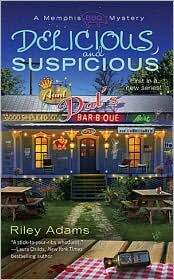 When an anonymous food critic blasts several local restaurants—including Aunt Pat’s—Lulu Taylor and her customers are biting mad, especially when they learn that Eppie Currian is the pen name of their friend Evelyn’s cheating boyfriend. When “Eppie” gets his own fatal review, the list of suspects is longer than the list of specials at the best BBQ place in Memphis. Since she runs the hottest BBQ joint in town, Lulu knows just about everyone in Memphis. But one person she'd rather not know is Tristan Pembroke, a snooty pageant coach with a mean streak longer than the line outside Lulu's restaurant. When she finds Tristan's dead body stuffed in a closet at a party, the police are suspicious--especially since Lulu's developed a taste for being in the wrong place at the wrong time. Caught in a situation stickier than molasses, Lulu must clear her name--or risk getting fried. 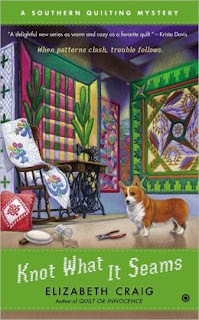 The Southern Quilting Mysteries by Elizabeth Craig for Penguin/NAL. First book--Quilt or Innocence. June 2012. But when Judith is found dead, the harmless gossip becomes an intricate patchwork of mischievous motives. And it’s up to Beatrice’s expert eye to decipher the pattern and catch the killer, before her life gets sewn up for good. Second book in this series is Knot What it Seams, which released February 2013--see top of page for details. The sleepy town of Bradley, North Carolina, might not be as quiet as it seems. Murders happen at a steady rate and octogenarian amateur sleuth Myrtle Clover is determined to solve them before her police chief son. No one in Bradley, North Carolina, is exactly crying into their sweet tea over the murder of Parke Stockard. Certainly not retired schoolteacher Myrtle Clover. Upon discovering the corpse, Myrtle is struck-not with grief, but a brilliant idea! Solving the crime would prove to everyone (especially her son Red, the police chief) that this octogenarian isn't ready to be put out to pasture just yet. The victim, a pretty but pushy town developer, had deep pockets and few friends. Even when another murder takes place, proud Myrtle forges on, armed only with a heavy cane, a venomous tongue, and a widower sidekick. The Publishers Weekly review: "The amusing first in a new cozy series from Craig...Myrtle's wacky personality is a delight." Octogenarian Myrtle Clover isn't thrilled when her book club morphs into a supper club. But things get a little more interesting when a body is discovered during the third course. Can Myrtle's sleuthing smoke out the killer before her goose is cooked? December 2011: "A Dyeing Shame"--a Myrtle Clover ebook. $2.99. Octogenarian Myrtle Clover, bored by bingo and bridge, is intrigued by the crime...and her neighbors' secrets. But discovering, and blabbing, secrets got Tammy killed and Myrtle soon learns her sleuthing isn't just dangerous...it's deadly. 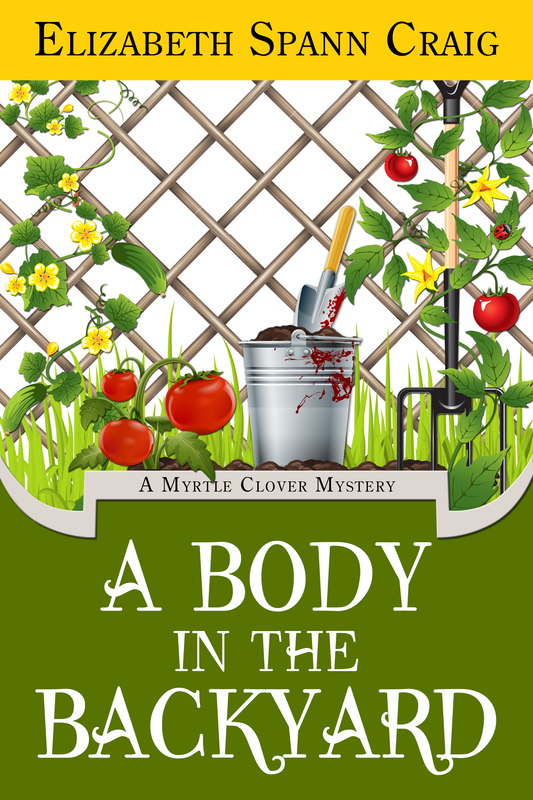 Coming November 2012--A Body in the Backyard--a Myrtle Clover mystery.